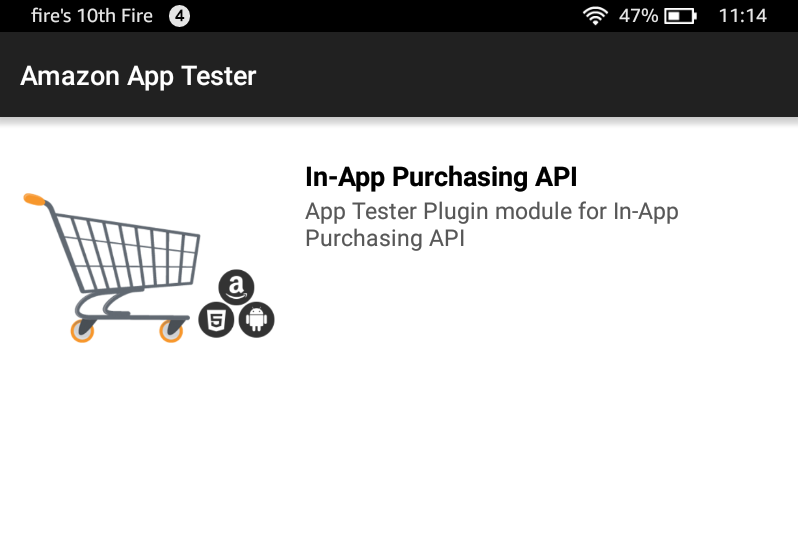 The App Tester tool enables you to test Amazon In-App Purchasing (IAP) features before publishing your app to the Amazon Appstore. Once you have downloaded, installed, and set up the App Tester tool, you can start testing purchasing features in your app. Note: Users will not be able to make additional in-app purchases until all previous purchases are marked as fulfilled or unavailable by the notifyFulfillment() call. This logic helps ensure that you have correctly implemented this part of the IAP SDK and only applies to App Tester, not production behavior. If you have not already set up the App Tester for your app, see Install and Configure App Tester. 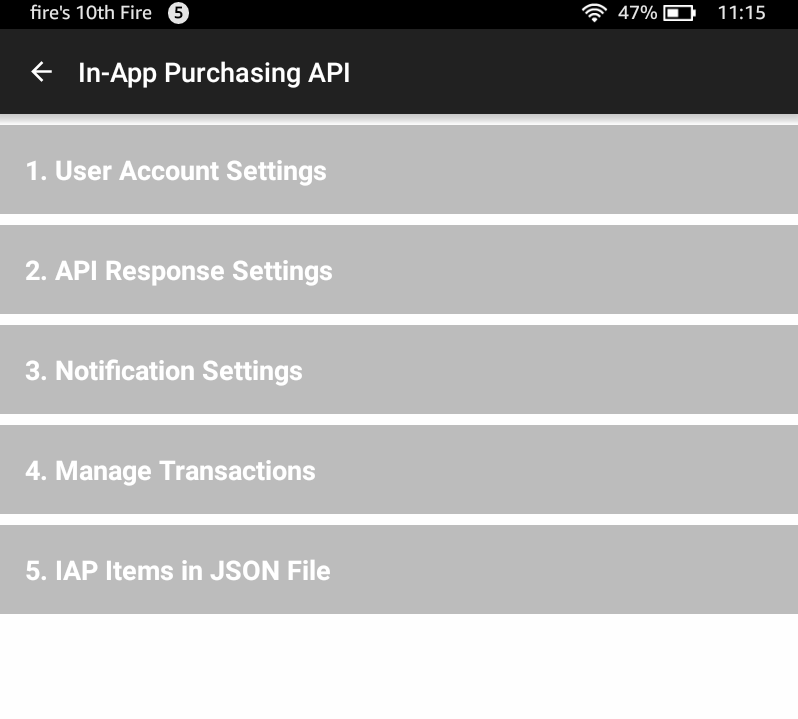 Tap the In-App Purchasing API prompt to begin. User Account Settings: Configure the user test accounts for your app. API Response Settings: Configure the conditions and responses for your test cases. Notification Settings: Enable or disable the notifications that are added to the notification drawer. Manage Transactions: Manage the active IAP transactions for your app. IAP Items in JSON File: View the data that you added to the App Tester from your JSON file in an easily human-readable format. You can log a user in and out, change users, and change the market place associated with a user. These options facilitate testing different scenarios with different users in different marketplaces. 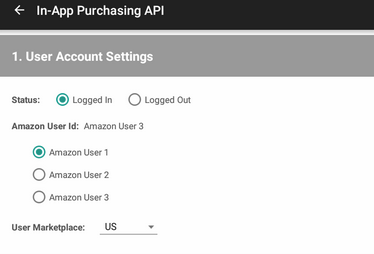 To access the user management screen, select the IAP API from the App Tester landing page, then tap User Account Settings. To toggle the current user between being logged in and logged out, under Status tap the Logged in or Logged Out option. App Tester provides three different test user accounts. Test users are named Amazon User 1, Amazon User 2, and Amazon User 3. To change users, look under Amazon User Id, and select the user Id that you want to use for testing. When specifying a response, "Default" in the following sections simply means to use the existing default settings. "Default" is not an available setting itself. If you explicitly select a value, such as SUCCESSFUL or FAILED, the App Tester will return the selected value. For example, getProductData will return SUCCESSFUL if the JSON file contains the requested SKU. GetUserData will return FAILED if the user is set to Logged Out in User Account Settings. 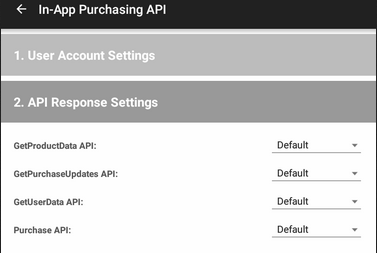 The following table shows the available responses for the IAP APIs. Use the Notifications Settings tab to easily enable or disable the notifications that are added to the system's notification drawer. Purchase Updates Notifications: By default, Amazon sends a notification when an app loads a purchase dialog but has never called getPurchaseUpdates(). 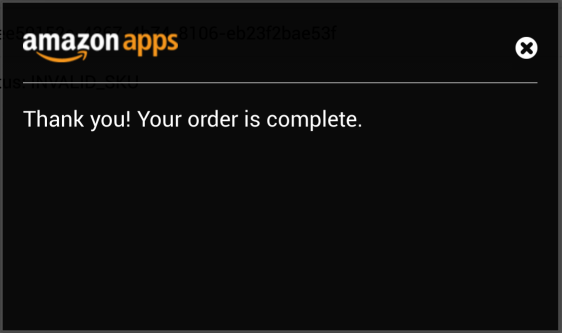 Amazon stops sending this notification after the app calls getPurchaseUpdates() once. Use the Purchase Updates Notifications setting to toggle whether Amazon ever sends this notification. Notify Fulfillment Notifications: By default, Amazon sends a notification if a user makes a purchase and the item is not fulfilled within 30 seconds. Use Notify Fulfillment Notifications to toggle this notification on or off. Reset Purchase Updates: Resets the state indicating whether or not getPurchaseUpdates() has been called. Use the Manage Transactions tab to view, cancel, and delete purchase transactions for the current user. Cancelling and deleting transactions are helpful tools when testing entitlements and subscriptions. This tab displays all transactions for the current user. RECEIPT: Type of product purchased. Valid values for IAP are CONSUMABLE, ENTITLEMENT, and SUBSCRIPTION. RECEIPT ID: Unique identifier for the transaction. SOLD BY: App that sold the item. PURCHASED ON: Date that the item was purchased. STATUS: Transaction status. Valid values are PURCHASED or CANCELED. These App Tester values map to the IAP API values FULFILLED and UNAVAILABLE, respectively. When an app calls PurchasingService.notifyFulfillment(receiptId, FulfillmentResult.FULFILLED, the receipt shows up in the Manage Transactions section with status: FULFILLED. Refresh the list of transactions for the current user. Delete all transactions for the current user. 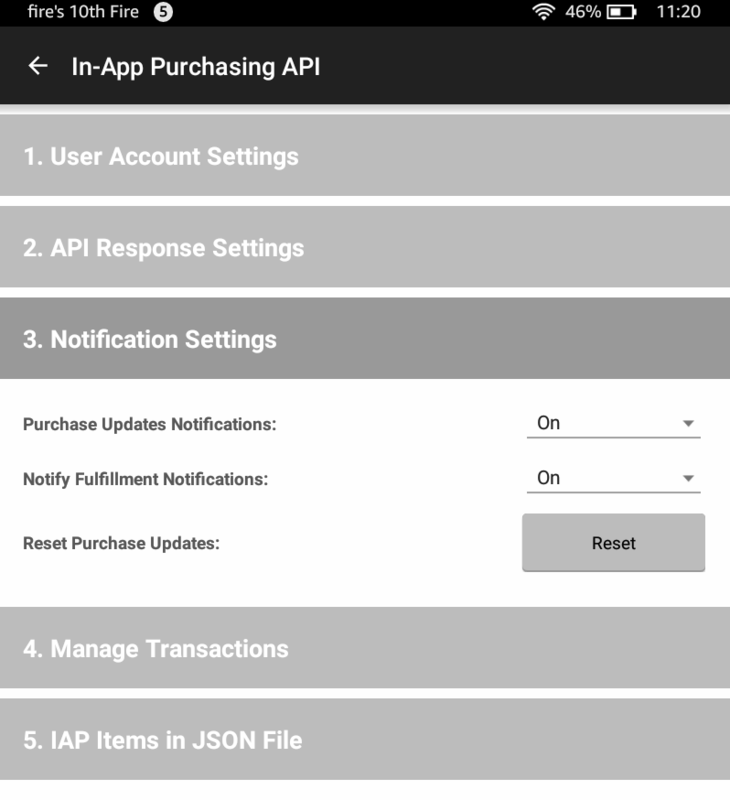 To provide an easy way to view the IAP items in the JSON file that you configured in Installing and Configuring the App Tester, tap the IAP Items in JSON File tab. If you have correctly added a valid JSON file, the App Tester will parse and display the contents of the file under this tab. If you have not correctly added a valid JSON file, this tab will either display an error message or will specify that the JSON file does not exist. 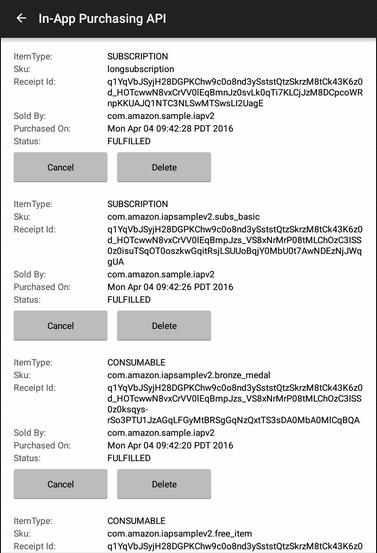 In addition to providing responses to API requests, the App Tester can display purchase flow dialogs, just like a live, published app does. The benefit of this feature is that the dialogs can help you to evaluate the user experience for your app's purchase process. Connect the Android device with your app and AppTester to a computer running Android Debug Bridge (ADB). 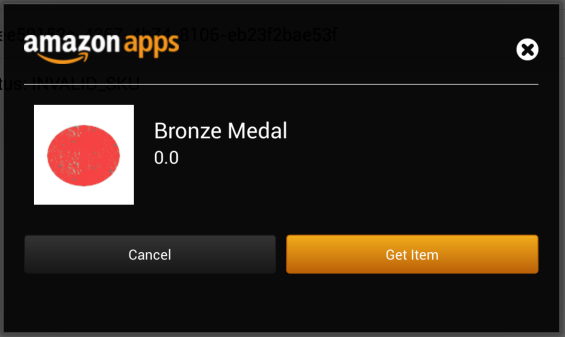 Search for the tag "AmazonAppTester" to view the AppTester log entries. If you are using the Eclipse DDMS development environment, you can filter App Tester generated log entries by entering tag:AmazonAppTester into the filter text area in the Logcat tab.